The survey we did of Spring/Summer pieces in the shops was very popular back in June. This Autumn/Winter, therefore, we thought we’d do two separate ones - the first (today) on winter knitwear, and the second on casual winter coats. As with that first piece, the aim is to survey all the top-quality pieces in the shops. They have to fit the general aesthetic and quality aims of Permanent Style, but we also want to be fairly broad in the types of brand we include, from high street to designer. Again as with that last list, we visited around 30 stores in London, and considered online offerings from anyone that shipped to the UK. We were interested in any knitwear, but particularly those big, chunky pieces that only come out at this time of year. Although based in Antwerp, Howlin’ make all their knitwear in Scotland, and excel in doing fairly basic pieces at great prices. I have a shetland sweater I got last year at Trunk, which I love, and this year bought a navy turtleneck too. It’s wool, not cashmere, but has a soft handle. The sizing is often generous - I am a 39-inch chest and wear a small. But in that smaller size, the fit through the waist is nice and neat - unlike most traditional Scottish knitwear. Trunk has what you’d expect - classic styles in classic colours - while Mr Porter has a bright, bolder selection. I wrote about this piece in my feature on Connolly back in July, and for me it captures the USP of Connolly: interesting, modern styles from top-quality, traditional manufacturers. This sweater is a little short in the body, a little big in the chest, and has a rather long cuff: all small details but ones that create an unusual, vintage-style silhouette. Cream is obviously an indulgent colour, and the piece is 50% silk, 50% cashmere, which gives it a slight lustre. But if you want something unusual, luxurious and traditional, this is great. Including Luca Faloni in this list won’t surprise many readers. 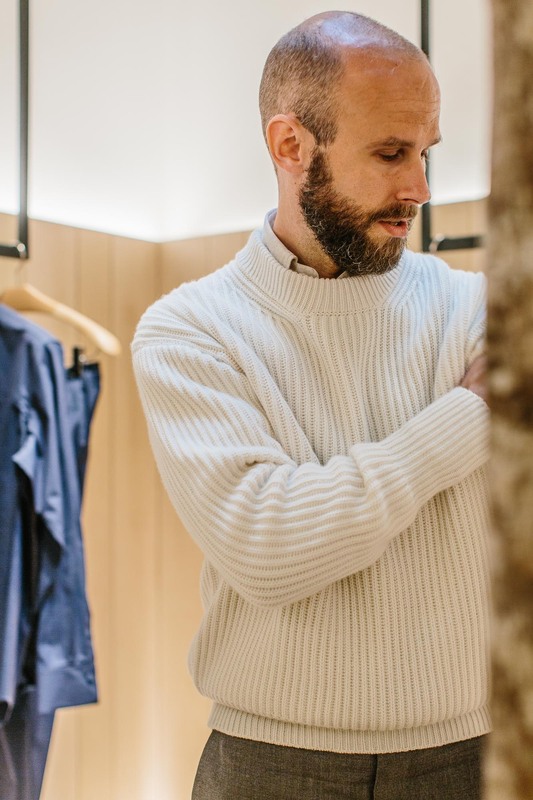 The Italian’s online range of top-quality, well-priced knitwear has been popular ever since it first featured on Permanent Style, and was especially popular at our pop-up store in the Spring. Luca’s models are relatively slim fitting, two-ply cashmeres in nice Italian colours (my favourite being ‘nocciola brown’). They’re great value and great basics. This season he has introduced a cable-knit range, which just launched this week, and expanded the hoodies into new colours. I know hoodies won’t be for everyone, but they do look relatively dressy with their button front, and work best with a shirt underneath. I’ve always liked shawl-collar sweaters, primarily because they have the flexibility of being worn with a shirt or a T-shirt (and having a relatively long neck, I don’t think a sweater without any kind of collar suits me). They are often pretty dull, however, and can be large in the body. If you get anything from designer brands, it is often a more interesting take on design - whether it be in cut or material. 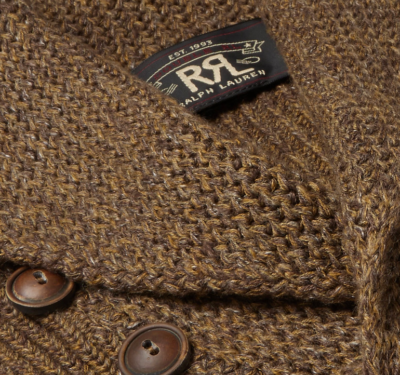 Here, I loved the melange yarn of the RRL shawl collar, which manages to both suggest the rugged, workwear look the sub-brand aspires to, yet also feel luxurious and redolent of the colour mixes in Harris tweed. A nice fit too, though being cotton it is relatively heavy for the warmth. A nice piece for in-between seasons. Staying on the theme of appealing design in yarns and knits, this Roadster piece from Loro Piana has a really beautiful twill pattern in a melange of greys. It won’t matter to everyone that this knit pattern is something LP has developed themselves and you won’t see anywhere else - but it’s one reason that simple colours from other brands can be called basics. A navy crewneck is not that hard to get right and offer at an attractive price; but some readers will also want something more unusual and designed, without straying into the block colours or silly messages of the real designer brands. I was also struck when I tried on this piece how much LP’s sizing has changed in recent years. I still have a Roadster that I bought at Bicester Village eight years ago - it’s a size 46, yet is considerably bigger in the waist than this, which I tried in a 48. I could easily include three or four sweaters from A&S, but I’ll keep myself to two. The first has to be their shetland crewnecks, which come in a huge range of colours - all beautiful mixes of heathery, autumnal colours. My favourite is the light brown (pictured, from my Begg scarf piece) but I also have the dark green and have my eye on indigo for this winter. Shetland is a hardy, stiff wool whose appeal is similar to tweed - I wouldn’t wear it over a T-shirt, where it would be next to the skin, but over a shirt it’s wonderful. It’s also great value as a result. I also recommend the A&S seamless ‘slipovers’ - sleeveless sweaters with a high V-neck. I don’t normally like such a high V, but I have a navy and a grey that have become my default piece to put on over a shirt, with jeans, when I come home from work. This Massimo Alba piece is relatively expensive, but stands out for its garment dying, which creates an interesting, faded look around the seams. It’s hard to tell from shots online, but in person the fading is rather subtle and irregular, giving the impression of a long-worn, much-loved sweater. It is also a nice neat fit, and beautifully soft cashmere. I can understand why some people might not like this style - that it is trying to merge two things that should be kept apart, namely vintage sportswear and luxury cashmere. But this kind of merging is also what Italians often do so well, and what always prevents tailoring from looking too conservative and staid. File it with Barbours worn over suits, and denim shirts under jackets. This chunky, shawl-collared style is a menswear classic. It’s big and roomy in the fit, but you can size down and is often worn open, more like a jacket than a sweater. I generally prefer them with regular buttons rather than the leather-wrapped variety seen on some models, and the Scott & Charters version on No Man Walks Alone has these as well as a good colour range - six including grey, charcoal and navy. Scott & Charters knitwear is all made in Hawick, Scotland and is generally very good value for money. 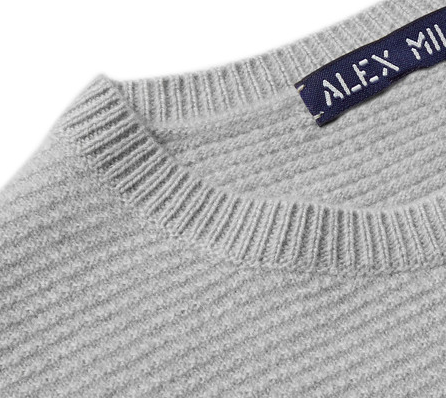 New York brand Alex Mill is usually a good source of basics in knitwear - a decent design awareness, classic fit, mid-range materials. Rather like Jigsaw in our Spring/Summer top 10, I’d recommend Alex Mill to readers looking for cheaper versions of popular designs. This waffle-knit piece is a good example. Waffle knits have been everywhere in the past few years, and I have a version from Ralph Lauren Purple Label in exactly this shade of grey. Its cashmere is a lot nicer, and thicker; but then it was also three times the price. Alex Mill also have some nice loopback sweatshirt models, aspiring to something similar to the Massimo Alba listed above. 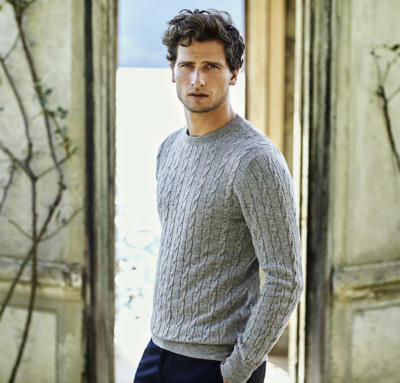 You can follow the discussion on Our Autumn knitwear Top 10 by entering your email address in the box below. You will then receive an email every time a new comment is added. These will also contain a link to a page where you can stop the alerts, and remove all of your related data from the site. Correct, the price remains £225 for Crew Necks and V Necks, but for Cable Knit we had to charge more. There is a bit more cashmere and manufacturing also costs more. For all other designs we did not increase prices from last year, despite the lower pound. Hope this helps. I am glad you are happy with the purchase! Hi Simon, i’m a big fan of shawl collar cardigans as well. For fall I want to invest in something decent. I prefer slim fitting and shorter knitwear. With that in mind. Which one would you recommend if given the choice between Lockie (armoury, drakes), A&S and the in your article mentioned Scott&Charters? Can I recommend Thom Sweeney to you Mike. They do a shawl cardigan made by Lockie but a slightly slimmer shorter cut than Drakes. It also has horn buttons instead of leather – again making it slightly more modern. Mr Porter have one in light grey but TS themselves have other colours on their website. I recently got the navy and charcoal ones and I am living in them. I actually had to size up, something I never had to do with Scottish knitwear before. Good call Adam, they are nice. Im not sure if this is useful info but I tried pretty much every shawl collar cardigan before accepting I had to pay for the Drakes one. While, I agree on preferring normal buttons, the cut of every other I tried was just not very versatile. A&S are lovely and good value but v smart (something to be worn with flannels and a button down in the office) there is definitely a place for them but not what I was looking for and not a subsitutee for other shawl collars. The S&C ones I tried were incredibly long (I’m average height) and they were longer than any jacket I own. Maybe the fit has changed but they were too casual for the office and way too long to wear with jeans etc. In the end the only one I found which would work in both settings was the Drakes one and as they only did cashmere (until this month) v expensive! I always thought there was a hole in the market for a more affordable (lambswool) version and now there is a Drakes one. 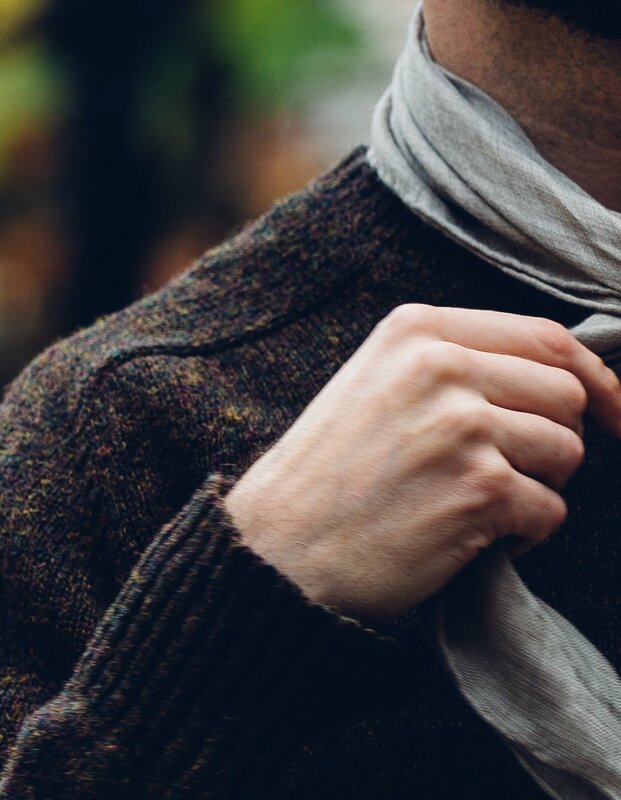 Terrific article and very helpful comments from everyone on shawl collar cardigans. I’ve been eyeing up the S&C model for a while now and even tried calling the Scottish manufacturer to see if they could sell me one directly or point me towards a UK stockist. It is one of the perversities of globalisation that the only solution seemed to be (the excellent) No Man Walks Alone in the US – where you’d be paying for the cardigan to be shipped back and forth across the Atlantic and then get stung by import taxes as well! Having said that, I agree with Rob that the new Drake’s lambswool model is a great fit at a much more affordable price point. The size 36 is a slim fit on my 37 chest but with plenty of room to do up the buttons. The size 38 works too but is more of a classic look. I also picked up an A&S shetland recently after admiring them on Simon. Absolutely gorgeous deep brown studded with oranges and pinks and blues and greens but it does get a little itchy. The staff at A&S were, as always, very helpful. They were also very honest in warning me that some of the sizing on the shetlands was a bit varied owing to some confusion with the manufacturer taking measurements pre and post washing. In other words, check with them which batch you’re getting because one batch fits a size bigger than the other. Most of them looks really good. I would though have expected, at least one V-neck as well, but assuming it’s impossible to please everyone, only showing a limited amount of pieces. Personally I would recommend, some of the most beautiful British/Irish specialties, like the Guernsey sweater or the Aran sweater. Really nice rough look and hot as hell “inside”, but luckily you don’t need an over-coat. Really great article Simon, thanks. Knitwear is my absolute favourite ‘category’ of clothing, so I always get particularly excited around this time of year. Dan, always worth considering sending it to Love Cashmere – see my post here. They’ve done wonders with my things. A 50p hole sounds big and perhaps too big though. It may be worth sending them a photo to see what they think. Will depend how commonly available the yarn is too. Thanks very much – that’s definitely worth a try, rather than just writing it off as lost. Quite surprised by the absence of Inis Meain here. Thanks for this, a really great post which I’m sure has something for everyone. The Loro Piana and Connolly are a little much for me to spend on a single piece of knitwear – but the Scott & Charters and Howlin’ are great finds that fit my casual aesthetic and I already had my eye on those A&S shetlands. I’m curious as to what makes you recommend Luca’s cable-knits over the Scottish makers (Johnstons, Lockie etc). Is it purely to do with fit/style or is there more to it? Thanks Simon for the great post; extremely useful! I love the A&S shetland sweater but I have never had the chance to try it on… What is the fit? I am very tall and slim with quite long arms (I wear an M in John Smedley Bobby) and I am looking for something quite slim fitting. Would it do the job? Thanks! I have an unrelated question for you regarding shoe care. I recently purchased a pair of boots from Carlos Santos in white crust leather that were factory patinated to a dark brown. With regards to maintenance, I have read conflicting reports regarding the ability of cleaners, conditioners, cream polishes, and wax polishes to alter or strip such a finish on crust. Which products would you recommend using to maintain the color? I am inclined to use neutral cream polish and wax polish in the color of the shoes (the latter being the only product recommended by Carlos Santos when I asked them) but I wanted to get your perspective first. I think that sounds like a good approach David. Natural creams and either a polish the same colour as the shoes, or a tan. Tan won’t affect the colour much but lends a little brightness. The patina will inevitably change a little over time with wear and maintenance, but I’m sure you can have them redone at some stage. Thanks very much Simon, it’s good to know that light colored creams won’t strip the finish. With respect to cleaners and conditioners like Lexol and Saphir Renovateur, would you say they are safe to use as well? No, there’s a bit more risk there. Creams generally and particularly something like renovateur will strip off some of the polish. Stick with an occasional use of regular cream. That’s the insight I was looking for. Thank you very much, very clear and insightful as usual. Simon, I notice that there’s no mention of John Smedley knitwear in this piece. As I recall you’ve written very favorably about the company’s quality and design in the past. Has there been a negative change at JS that we need to know about? I would like to use the opportunity to ask you some questions about knitware. In the past I have read your article about the german company Falke. How would you rank their knitware compared to the mentioned knitware companys? I plan to purchase a sweater or cardigan in charcoal, because I don’t need another one in navy or grey. Unfortunately there seems to be no article, where you are wearing charcoal knitware for reference. As a dark color, I would suppose, the trouser and shirt colors should both be lighter. What colors work well with a charcoal colored knitware? Maybe you could write an article how to combine knitware with jackets and trousers in the future, as you did a very helpful one with trousers and jackets. I only know Falke for socks, haven’t tried any knitwear. (Since I’m debating between the S&C navy blue and tartan green shawl collar cardigans) What’s your view on more vibrant greens (non-dusty/forest green) as a knitwear/outerwear choice? I’m concerned the color may be beautiful in the abstract but entirely (not just somewhat) inflexible in practice. When you commission a new jacket for the autumn / winter, do you usually request to have it cut with a little extra of room so that you have the option of layering with knitwear? You say you don’t have your jackets cut tight, therefore as a follow up , approximately how much room and where do you allow for ? Chest ? Shoulders? Waist ? And where would you allow for it if you had to accomdate layering thicker knitwear ? 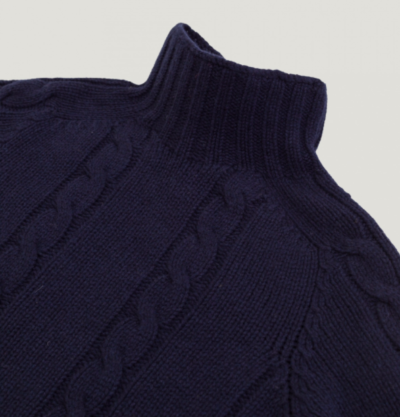 I wouldn’t have something cut to allow for heavier knitwear – it would look odd without. I’d use a pea coat or topcoat there. And even with thin knitwear, I don’t consciously allow any more room anywhere. It’s merely part.of the general point that you should resist the urge to have jackets cut too tight. It doesn’t usually actually look slimmer – the natural line of the chest, through waist and out into hips, does that already. Have you checked out the new cableknit Edward Sexton is selling? I don’t own one, but I tried one on last week, and they are beautiful. Great article Simon, as always, with some useful inspiration. On a side note, having only recently come across your site, i’ve been going through your earlier posts and stumbled across your collaboration with John Smedley on the perfect cardigan. Now they no longer stock it, can you recommend any others with a shorter length? The Armoury do some nice ones, though they are shorter still I think. Thanks Simon, that’s exactly what i was looking for. When are you planning the next pop-up? Hmmm! I’d add the burnt orange ribbed knitwear at Albam which I recently bought while buying their Selvedge Jeans. This was after my True Religion jeans fell apart on me in less than 20 outings. 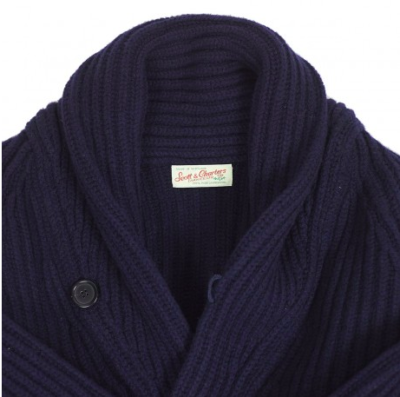 Worth havng a look at Cordings who have an excellent range of chunky knits and shawl collar cardigans…. Slowhand will be pleased to hear you say that. It’s exactly why he bought the company. I am reminded, by reading this comment, that he bought the Cordings business because he had spent his early years admiring it, and wanted, when he could, to keep it going as it had always been rather than try and “reinvent” it or turn it into a “brand”. Made a comment here yesterday that it was the aspects of tradition you mention that prompted Softhand to buy the business, but it didn’t get through so here it is again. And in the shawl collar, at least, it’s difficult to size down to get a slimmer fit as their smallest size is a medium. 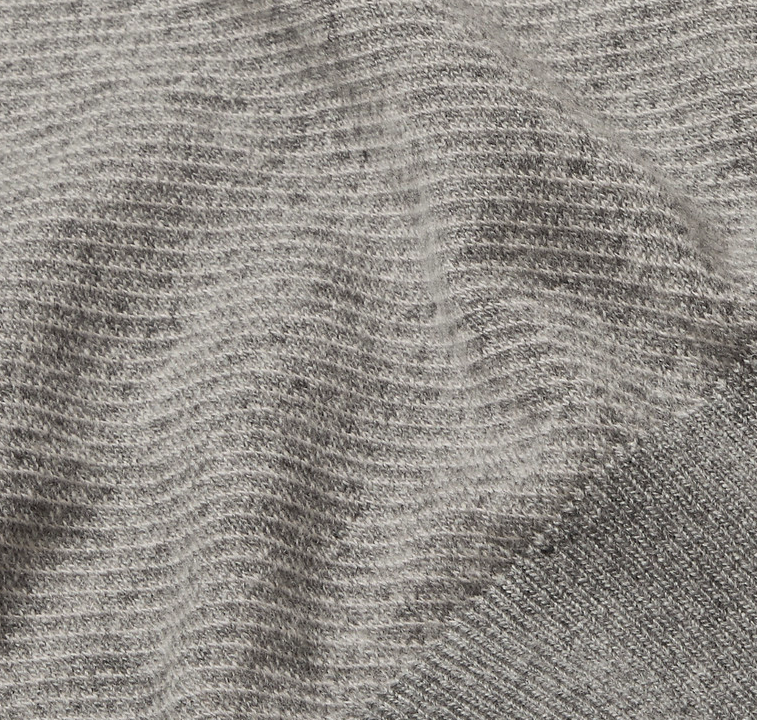 did you have a look at Asket’s cashmere sweaters? Very interesting for a guy with wonky proportions like me. No, though good point I had reviewed them previously. Simon, nothing outstanding at N. Peal? Not particularly. Their women’s designs are always interesting, but the pieces for me are surprisingly unoriginal and surprisingly expensive I found. Frankly, they are streets ahead of many you have featured and their Thames Cable Cashmere Crew neck and their Classic Cable Roll Neck Cashmere are fabulous designs and at £299 represent extraordinary value. You need to take a good look. Thanks David. I did look in the store and try a few things as part of this research process. The fit as mentioned was one issue, and while not as expensive as some of the designer brands here, they are still more expensive than the likes of Luca Faloni without any obvious improvement in quality. what do you think of pairing knitware with polo-shirts (eg. The Friday Polos, either with short or long sleeves)? 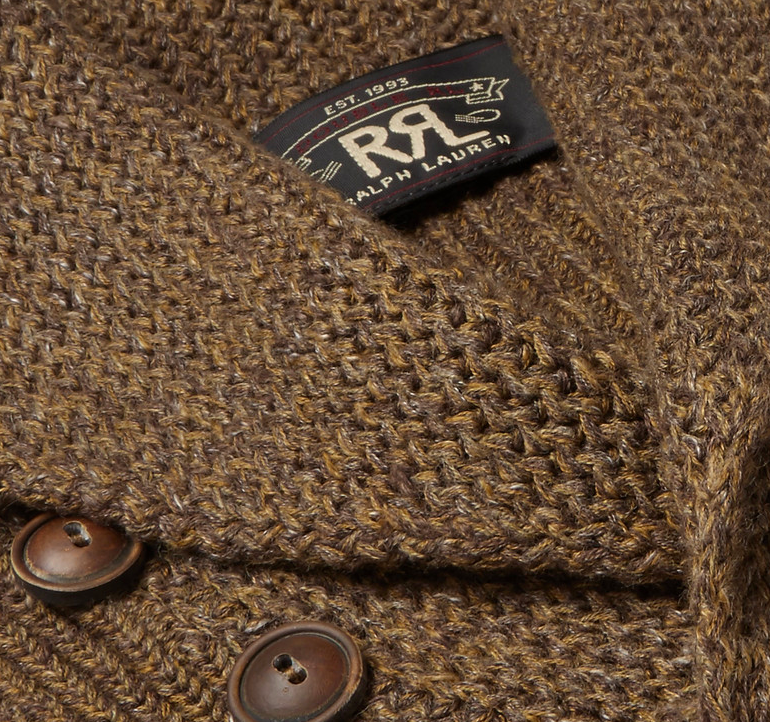 Which style of knitware (crew-necks, cardigans, v-necks…) would you rate as most suitable for combination with polo shirts? Does the proven rule, the shirt should be lighter or darker than the knitware, apply here too? I find it difficult to pair a navy, green or charcoal polo shirt, maybe it is not possible? Slightly off topic, but what is your opinion on Luca Faloni’s shirts and polo shirts? Thanks Mike. I don’t wear them really as I have things made bespoke mostly. Could you be more specific on what you see as poor finish? Shirts is always an interesting area for what people perceive as quality. Although Luca Faloni’s service is impeccable I noticed the finish of the shirts is not at the same level as some other machine made shirts I own. For example, I noticed the placket was not aligned correctly and the linen fabric showed too many irregularities (pieces of fabric popped out). I am not sure if this was an incident, that’s why I asked your opinion. Many high quality shirts (Emanuel Berg, Finamore etc.) often attach MOP buttons by wrapping extra thread around the threads that attach the button to the fabric. This is not necessary, but it makes buttoning a shirt easier. This feature is not available on Luca Faloni’s shirts. I am very happy with the sweaters though! Out of interest, have you found that on both the cotton and the linen shirts? I only ordered linen shirts, so I can’t tell anything about the cotton shirts. On the knitwear, I think we are in agreement that Luca is one of the best brands to go to for staples with a modern take. Love that navy hoodie that I got. Flannel trousers, chinos, jeans… it works with everything and the fit is spot on for me. The cashmere is aging very well so far, no pilling, still very nice and soft. Thank you for your feedback. Craftsmanship of our products and quality of the materials we use are at the heart of what we do, so we are sorry to hear that the shirts you received were not what you expected. If you could please send your contact details to our customer care team, we would like to look into this for you further and see if faulty items were sent to you. A while ago I was on the search for a military style sweater in wool. I was fortunate to find outdoor knitwear who make exactly what I wanted. 100% wool and made in England, I bought a black version without the military style patches on the shoulders and Elbows. It’s very basic and the styling I would say is very “in”. It’s manufactured in a style that makes it sort of stretchy so it fits very well. I don’t know how you judge wool quality based on a garment only, or without a textile merchant/expert, but I’m happy. It is a rough sort of wool so the feeling is not great against skin alone but over a thick shirt is great. I like the style enough that I’ve asked if they can produce a cashmere version for me. Unfortunately they are not equipped to make one-offs sadly. (Do let me know if you know someone who can). The sweater only cost me about £37.00 so very cheap and I think if it was branded would cost a lot more. Thanks Joel, interesting to hear. In general, good cashmere makes up a lot of the cost of knitwear, so something in a rougher British wool – and particularly from an online supplier, without overheads and perhaps made abroad – can be a lot cheaper. Also easier to make if it’s thicker. Not surprised they won’t do one offs though. Love your blogs on style. I am passionate about pure wool and its longevity – if cared for well. How do you care for your garments and how do you recommend others care for their own beautiful garments? A bit off topic Simon… Any recommendation when it comes to sweatshirts? Thanks. Have you tried Merz b Schwanen? Yes – see post here. Would you say The Real McCoy’s are better than Sunspel? Did you ever try Asket’s sweatshirts? Generally yes, but the difference is not big and also varies with the different Sunspel models. And design is potentially more important – Real McCoys are deliberately vintage styles and cuts, which some may not like. I am looking for some high quality slim fit (cotton) sweatshirts. What do you recommend? Didn’t realise the 10th anniversary of your blog was coming up… any plans to celebrate it? Over the time of your blog you have clearly moved up the price brackets significantly for your bespoke tailoring but how has your views on pricing of RTW changed over the years? Have your views on what price is a good value jumper also increased or have you just changed the sorts of brands you look at? In this post you say how great value a £250 jumper is, would the 10 year younger you have thought the same? I enjoy your blog, and have taken your advice/recommendations several times, but do wish that some of the non-bespoke elements could include at least some more affordable pieces. Thanks, yes, pretty excited about it! We’re hoping to have a celebration during the pop-up shop if we get confirmation on that soon. Any advice/suggestions on where to buy good quality 8ply or more wool or cashmere sweaters? Hello Simon,always enjoy reading your post.About the winter-coat article you mentioned,have you ever tried S.E.H Kelly?They’re one of my favourite UK made clothings that is similar to Private White V.C. in some way.If it fits your taste I’d love to hear your point of view on the their items. Just curious if you ever wear anything other than a t-shirt on under a turtleneck? I find a regular shirt collar bulges in an odd-looking way. Dear Simon, off-topic but any thoughts on corduroy trousers? I’m intrigued but from a style perspective perhaps a bit of a minefield. Apologies if you have opined on this elsewhere but couldn’t find anything in the archive (some bits on corduroy suits and some on jeans but no luck re corduroy trousers as a separate). A question for you regarding cashmere vs. wool shawl collar cardigans, if you’ll entertain it. Background: I live in Los Angeles, but I work in a law office that is kept *extremely* chilly for most of the 9-5 workday, so I often swap out my coat for a sweater during the day to stay alive. I also just love knitwear from my old life on the east coast. Question: I just got in the Drake’s navy lambswool shawl collar cardigan, and it’s absolutely fantastic. I love the fit, the style, everything. Given that, is this a piece where it’s “worth” (and I understand that question is, ultimately, personal) paying twice as much to get the cashmere version? 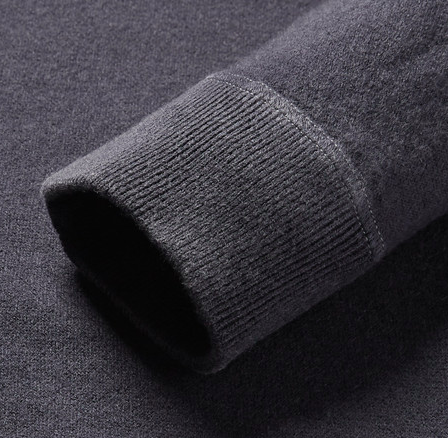 I’ve actually never owned a cashmere garment before and have no real sense for how it might hang differently, whether it exhibits greater fragility, how the feel is different, etc. But since I love this piece so much (at least I sure love it out of the box), I wondered if this would be the right time to splurge for a minor extravagance. Well, a cashmere version is basically going to be softer and warmer. Not extraordinarily warmer, but noticeably so. And softer – hard to say whether you want to pay for softness or not? It’s definitely a luxury, but really subjective, as you say, as to whether you want to pay for that or not. Thanks once again for this list, very very helpful indeed. I bought the Howlin’ turtleneck from Trunk, and it is lovely – warm, soft, and versatile. I’ve been wearing it dressed up with a charcoal flannel suit but also more casually with cream chinos, navy peacoat and (untied) light grey scarf to break up the colour a little. The one point I would make is that the sizing is very generous, as you pointed out. I am a 39-40 chest – and blindly bought a medium – but may have been better off with a small. A quick question Simon: I’m pretty sure we are the same size for knitwear, what did you take in the Alex Mill? Thanks very much again, really looking forward to the second part on coats as well! Would you be able to list and describe the different kinds of knits and weaves used in knitwear for example arran, cable, etc.? I’ve seen a pullover I like but don’t know what the weave is. Hmm, sure that sounds like an interesting project to do at some point. Do you know anything about Enzo Mantovani cashmere? It’s available at Costco, so not a premium brand. 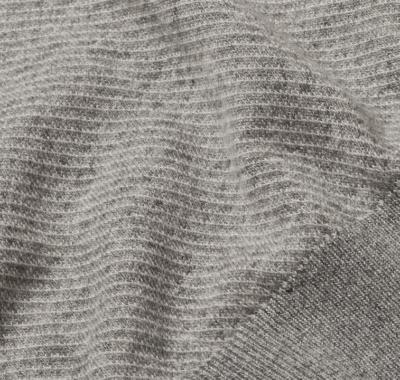 Quality wise, is it better to choose 2ply rather than 1ply cashmere knitwear? I’ve seen two sweaters I like, one by N Peal which is £159 instead of £259 at Bicester Village and the other is Luca Faloni which is 2ply. Whenever I’m looking at cashmere sweaters, it’s rare to see any info regarding the ply, how important is it? Simon, what’s your thoughts on William Lockie? I’m looking for a simple lambswool crewneck that’s not too “delicate”. What size do you wear in the Connolly and Luca Faloni sweaters? Thanks for your response, I’ve just ordered the Connolly in Large. I really enjoyed your post about how brands should talk more about the product, what’s your opinion on the quality of Tod’s knitwear? Do you still wear a size small in Luca Faloni sweaters? I seem to recall reading somewhere that you had sized up. Looking into getting the grey cable knit. why is the connolly piece so expensive Simon? How have you found the A&S Shetland to age? I recently picked one up and they recommended that I get a medium as they tend to loosen as they age. I went with their recommendation but it feels snug. Thoughts? Hi Simon, thinking of getting either the navy or dark green shetland for the office. Which would you recommend? Also, did you end up getting the indigo shetland? If so, how are you finding it? For the office? Probably navy.